The title is presumably a pun on Roger Corman's I, Mobster, missing out on the opportunity to sell the movie as Christopher Lee and Peter Cushing in a classic horror tale, with Lee adding to his formidable gallery of monsters. Besides the veiled title, the central characters' names have been changed from Jekyll and Hyde (to Marlowe and Blake), but Robert Louis Stevenson still gets a screen credit - a strange case indeed. Lee enjoys the dual role, but plays Dr Marlowe (Jekyll) as uptight and boring, whereas Fredric March and Spencer Tracy played the character as relaxed and normal. As Blake (Mr Hyde), his appearance degenerates, bordering on comical. Perhaps it's the nasty teeth or the nasty wig. The transformations are mostly cheated, either instantaneous or seen only as shadows. This is disappointing because it's the most anticipated part of the story. 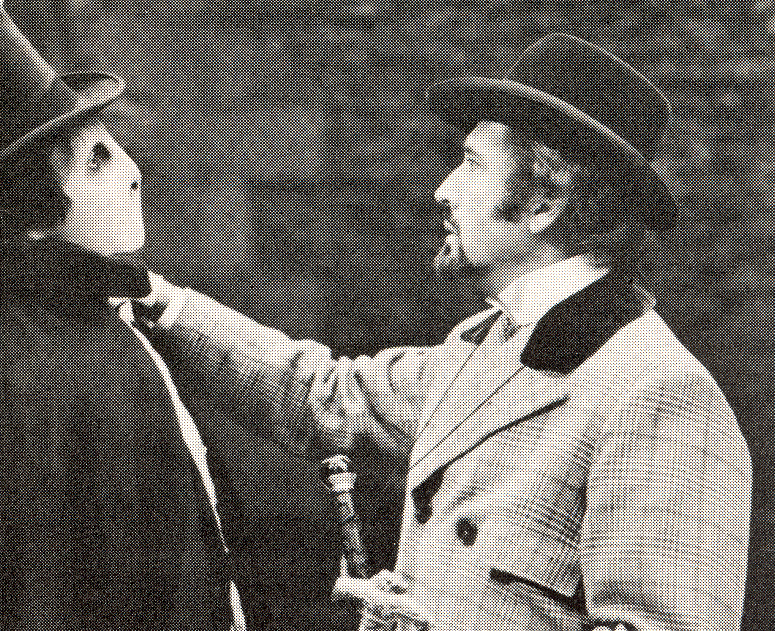 More interesting is a 'no-face' make-up (below in a scene not in the final cut) used only in a nightmare. 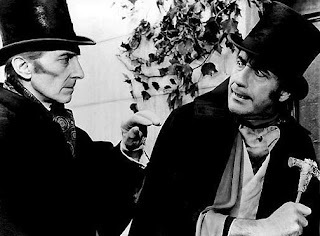 Peter Cushing is excellent as always, though he could easily have managed the reams of dialogue pointlessly handed over to non-actor Mike Raven (Crucible of Terror). Stephen Weeks was only 22 when he directed this, but made a much better job of the eccentric Ghost Story (1974), recently reissued on DVD. The producer, Milton Subotsky, cheekily blamed all the shortcomings of this film on him. There are some slight twists in this version. Marlowe is a Freudian psychiatrist rather than a medical doctor. Instead of drinking his experimental drugs, he injects them into a well-used vein, getting addicted in the process. But the story is overly simplified by removing the character of Dr Jekyll's wife, making his midnight wenching hardly transgressive at all. Any new angles in the script aren't as important as the way the story was filmed. known process which didn't need special cameras (and therefore cheaper to make). Instead it was the camera moves and layers of action that were orchestrated to trigger 'the Pulfrich effect'. This method of 3D has occasionally been used on TV in the past, long before the new specially-built screens. 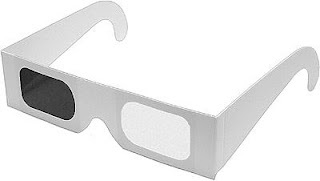 All that was needed to view the action in 3D were glasses with the right eye slightly darkened. The cheapest Pulfrich glasses would be a pair of sunglasses with the left lens popped out. Basically, any time a character (or object) moves left-to-right across a static background, it will pop-out in Pulfrich 3D. Even if you just watch the film 'flat', you'll notice a dozen scenes of characters walking down the long corridor to Lee's study, moving left to right. The whole title scene is also filmed this way. There's even a bizarre scene in a pub where Lee is talking to a potential wench in a pub and the crowd is jostling them along the bar from left to right. The complex choreography of the scene is all for the 3D. If the camera circles around the scene from right-to-left, the 3D works very well. The most spectacular 3D is in the daylight scenes (a misfire because most of the film takes place in the shadows of night and Lee's dingy house) when the camera circles a huge birdcage in a park. A variation is where the subject spins around - like the scene where Lee holds the mirror up to look at himself. The third main example is Dr Marlowe's study, dominated by a long desk stacked high with a wall of chemical lab equipment - this layer of glass between the actors and the camera is the central example of the layered, deep-focus sets, carefully laid out for Pulfrich 3D. Any movement between the subject and the camera (like a knife) will 'kick out' in 3D. 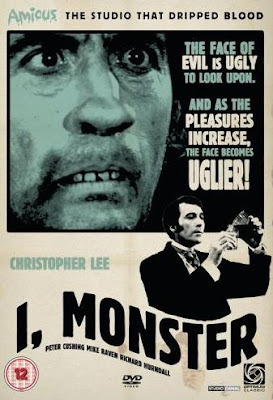 While there's plenty of 3D around at the moment, I've been particularly interested in the 3D effects in I, Monster because they're the only example of British horror in this period to be shot this way, and certainly an unusual treat for fans of Cushing and Lee. Much has been written about what everyone involved thought of the 3D process, but I've not seen any writers trying it out for themselves. To me, the 3D works well for most of the film and brings many scenes to life, which the movie certainly needs. The Optimum DVD from the UK in 2007 (pictured at top) is a sharp, clean-looking anamorphic widescreen presentation. 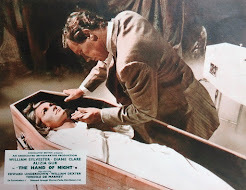 This version was longer than my TV recordings of the film, adding several early scenes of Dr Marlowe in his study and some of Mike Raven's pontificating. 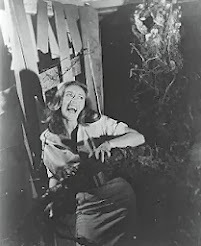 But many of the night-time scenes have been transferred far too darkly. All of Blake's night-time shenanigans are crushed into darkness compared to the TV version I was used to. When Blake stalks the wench emerging from the pub, the cobblestones are completely invisible in the shadows. This darkening of some of the film's action, also diminishes the 3D effects in the film. 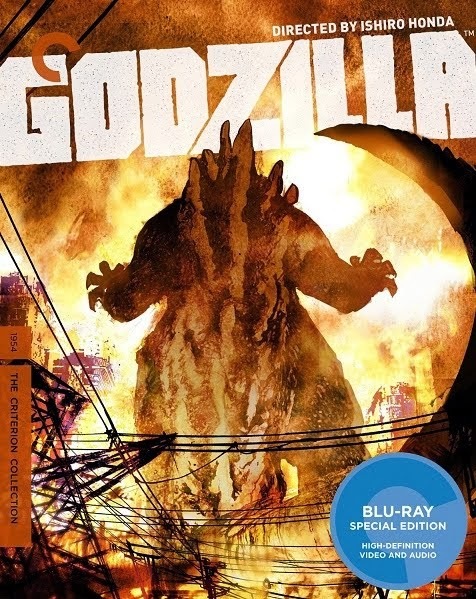 Perhaps we'll never see the day where I, Monster gets released with 3D glasses. Hated this film. One of the most boring and flat things I've ever seen in my life-I thought Lee's preformance was just plain amusing. As for the 3D effect I seem to remember an interview with Lee from the time saying that it looked no different. Good review though! was very pleased to hear the news of the UK release of Who Can Kill A Child? Like I said, we've heard from actors, producer and director talking about the 3D effect. I want to hear some independent opinions now.